Business Card Envelopes, Cream 2 1/8" x 3 5/8"
Measurements - 2 1/8" x 3 5/8"
Cream Business card size envelopes are great for gift cards and business cards. 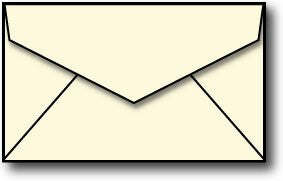 These very small envelopes can be used with our business cards, nametag cards, or folding business cards. Made from 24lb bond / 60 lb text weight cream paper, these business card envelopes measure 2 1/8" x 3 5/8". Moisture activated gummed flap. Note: Mini Envelopes DO NOT meet USPS regulations for mailing.